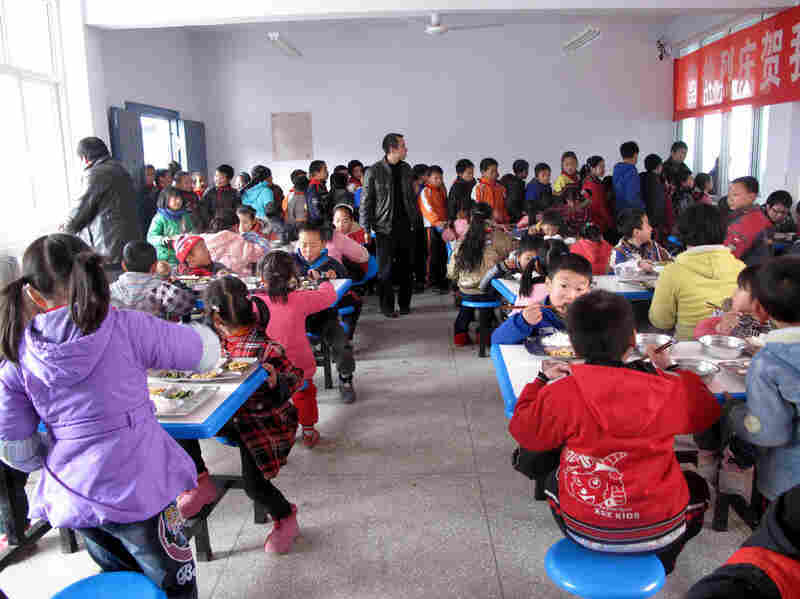 For China's 'Left-Behind Kids,' A Free Lunch Shocked by the poverty he saw on a reporting trip, a Chinese journalist set up a program to provide meals to 25,000 poor children in rural China, many of whom suffer from malnutrition. Indirectly, his efforts have prompted the government to ramp up its efforts to feed the country's most vulnerable. 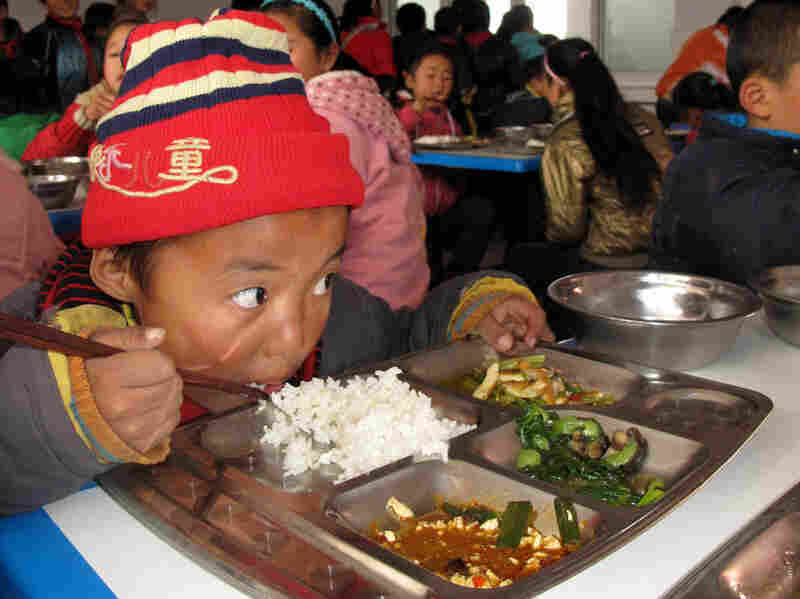 Hujiaying primary school in China's remote Shaanxi province is among the schools benefiting from the nonprofit Free Lunch for Children program. For many of the students, the free school lunch is the best meal of the day. A study last year found that malnutrition has stunted the growth of 12 percent of China's poorest children. 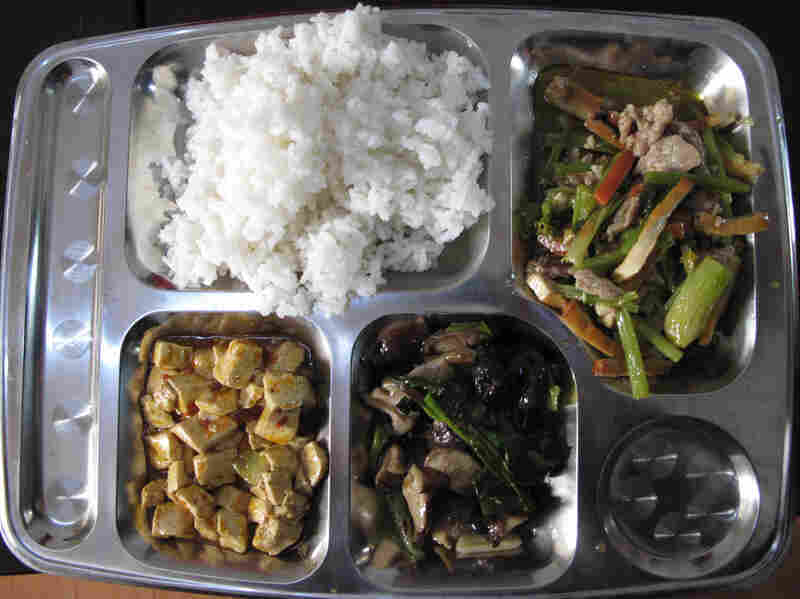 On a recent day, the children receive a tray full of rice, stir-fried pork with celery, spicy tofu and greens with mushrooms. 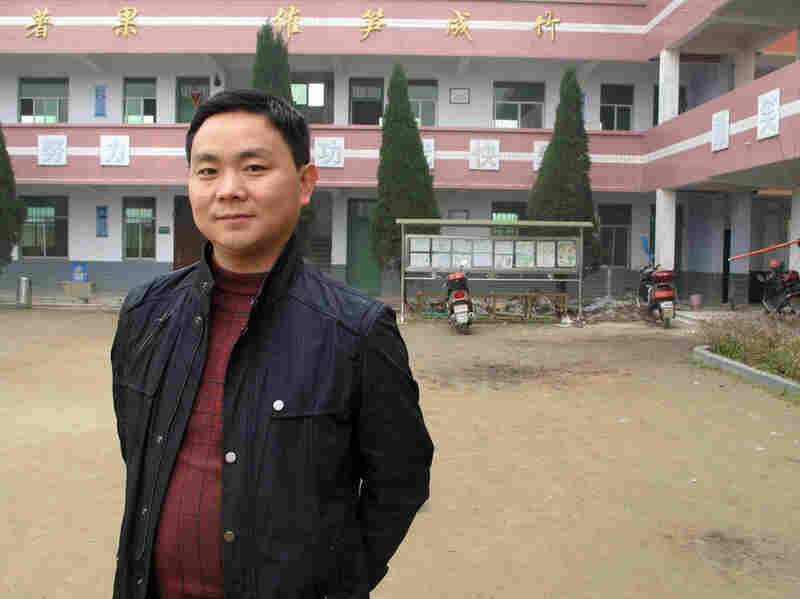 Bai Baojun is the school's headmaster. The parents of 80 percent of his students have moved away to find work, and many of these "left-behind" children routinely go hungry, he says. The school's new canteen was built with government funding; the government is also stepping up its efforts to provide nutritional supplement for the country's poorest kids. 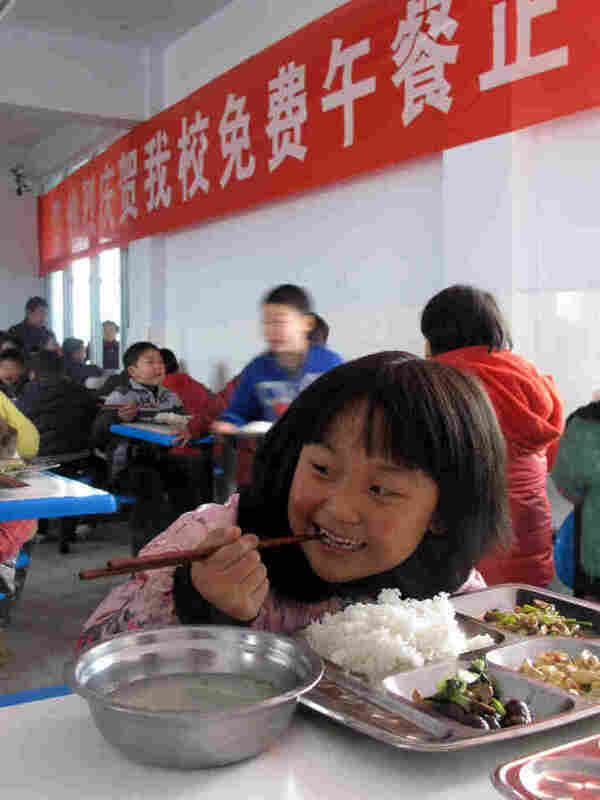 The Free Lunch for Children program is a godsend for 10-year-old Xie Xiaoyuan, whose family of five survives on just $120 a month. Xie has frostbitten ears from her daily trek to school. She eats no breakfast and, before the school lunch program, had only two pieces of bread to keep her going until dinner. Because they are so hungry, the children say, they are unable to concentrate on their lessons. The Free Lunch for Children program is the brainchild of journalist Deng Fei. In eight months, he raised $4 million online, and is now feeding 25,000 children a day. 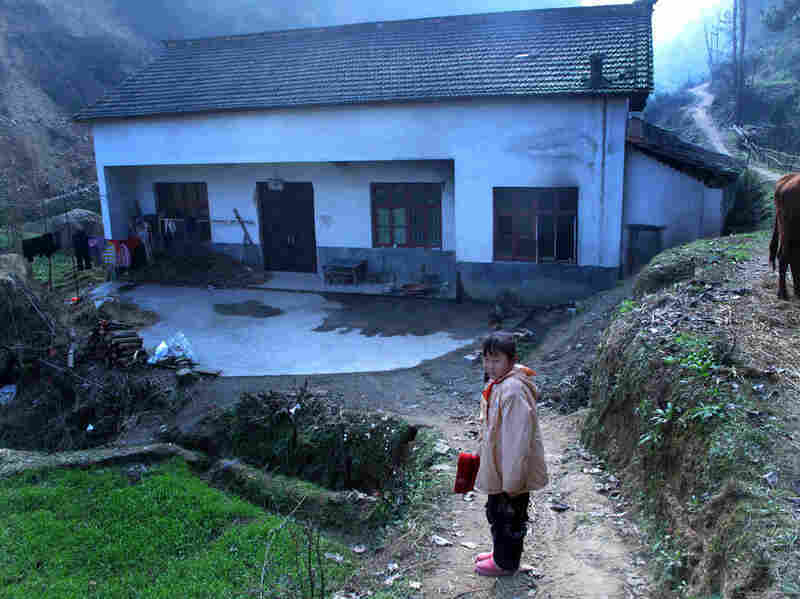 For 10-year-old student Xie Xiaoyuan, just getting to school is an ordeal. On a recent day, her frostbitten ears are testament to just how difficult the trip is. "I get up at five o'clock," she says, "then I comb my hair and start walking." 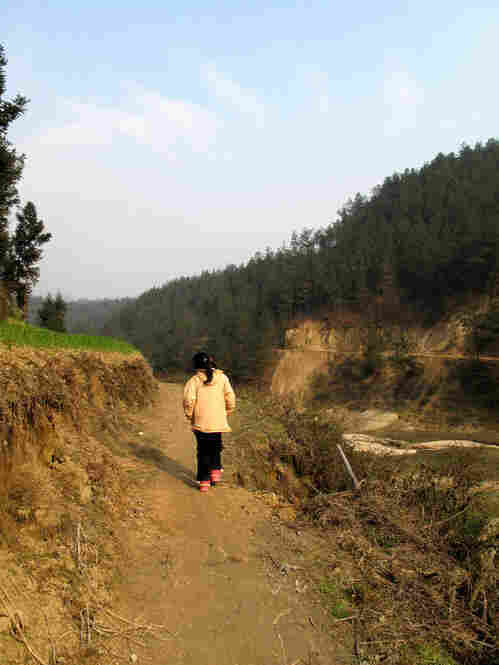 Xie navigates a mountain path in China's remote Shaanxi province in the dark, trudging through snowstorms and mudslides. Then she has to get a bus for about 10 miles. She hasn't time to eat breakfast. "For lunch, I spend 15 cents on two pieces of bread and a drink," she says. Students enjoy free meals on the inaugural day of the Free Lunch for Children program at Hujiaying primary school in Shaanxi province's Nanzheng county. There's no such thing as a free lunch — or so the economic theory goes. But that's no longer the case for Xie and the 25,000 poverty-stricken children in China who now receive a free meal, thanks to the "Free Lunch for Children" charity campaign set up by a Chinese journalist. Indirectly, his efforts have led to the government announcing it will provide nutritional support for 26 million of China's poorest children every day. For Xie, those two pieces of bread used to be all she ate until dinner at home at 5 p.m. That's all her family can afford, with their combined income of about $120 a month providing for five people. For a while, she even stopped going to school because the family couldn't afford her bus fare. But she returned after a teacher trekked to their village to inform her family that dropping out was against the law. Many of her fellow students at Hujiaying primary school in Shaanxi province's Nanzheng county go hungry every day. Eating no breakfast is pretty common for these "left-behind" kids, according to headmaster Bai Baojun, describing the hidden social costs of China's economic miracle. "About 80 percent of our kids have parents who've gone away to find work," he says. "For half our students, both their parents have gone away, so they depend on their grandparents, who can't help with their homework." China's growing income disparity can be seen in Shaanxi, and not just in the dirt roads, the lack of sanitation and the classrooms with no heating. In China's poorest rural regions, the physical growth of 12 percent of children is stunted due to malnutrition, according to a survey carried out last year by the China Development Research Foundation. The survey indicates that these poverty-stricken children are on average 2 to 6 inches shorter than Chinese city kids, a figure more shocking than any statistical abstract measuring inequality. Now, a new grass-roots program aims to change that by providing free lunches for thousands of rural children. It's the brainchild of a campaigning journalist from Phoenix Weekly news magazine, Deng Fei, who became famous for his campaign against child abduction. During a reporting trip to Guizhou province, Deng was shocked to discover that schools there had no canteens for students. He began raising money online from his 1.4 million followers on China's version of Twitter and at a popular online shopping site, soliciting donations of 3 yuan (less than 50 cents) to pay for one lunch for one poverty-stricken rural child. 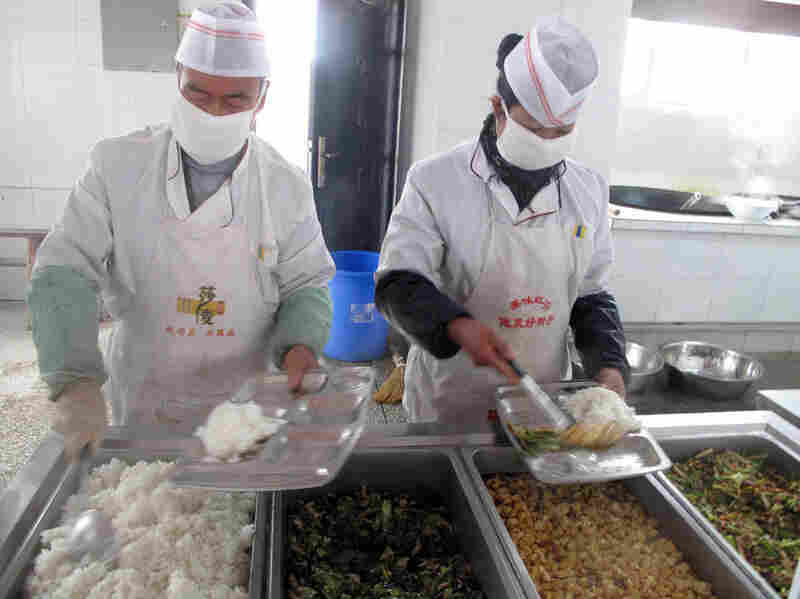 At Hujiaying school on a recent day, this money pays for huge basins of meat and tofu that are being tipped into enormous sizzling metal vats in the new canteen. The school chef is cooking for more than 250, stirring the food with a shovel to make sure it's all cooked. "Today is a day worth celebrating," says Bai, the headmaster, as he gives a speech to mark the first official day of free lunch. The students line up, applauding enthusiastically, though most of them have fixed their eyes on the lunch counter, salivating at the delights that await them. On this day, the free lunch consists of spicy tofu, stir-fried celery with pork, and mushrooms with cabbage, along with a hot soup. 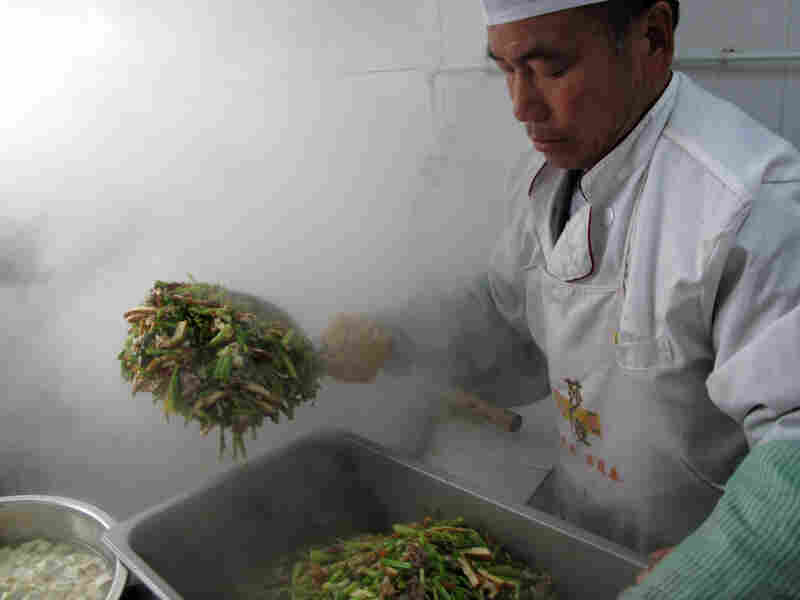 In the school kitchen, a cook uses a shovel for stir-frying. He is preparing meals for more than 200 students. For most of these kids, this is their best meal of the day. The government has recently reorganized rural schools, closing or merging smaller ones. This means it's not unusual for the more far-flung students to spend two or three hours walking to and from school, after which they may have to cook their own supper. In the dining room, they wolf down their meals, giggling as they use chopsticks to shovel hot rice into their mouths. Headmaster Bai patrols the tables, telling off students who don't finish their enormous portions. This "Free Lunch for Children" charity program has been remarkably successful, partly because of its high-profile support from some 500 journalists and their media organizations. "In eight months, we've raised $4 million in funds," founder Deng says. "Nine-hundred-thousand people gave us money. We've helped 162 schools to give free lunches to 25,000 children." He has been working closely with local authorities, who sometimes contribute funds or help target poorer schools. In the case of Hujiaying school, the local government provided 1 million yuan ($150,000) to build the school canteen. The government would probably have given some money for free lunches anyway eventually, but I think it would have happened later. Recently, the central government announced it will expand its own program, spending $2.5 billion providing nutritional subsidies for 26 million primary and junior high school students in rural areas. "[The expanded program] is to provide a nutritional supplement," says Du Ying, the deputy director of the National Development and Reform Commission. "The rough standard for each poverty-stricken student is to provide one cup of milk and an egg." The government — like the Free Lunch for Children program — is working on the basis of providing 3 yuan per student per day. Deng says there is "a definite link." "We can't say that our Free Lunch has directly led to the government's Free Lunch, because the government was doing this before, but there's a link," the journalist says. 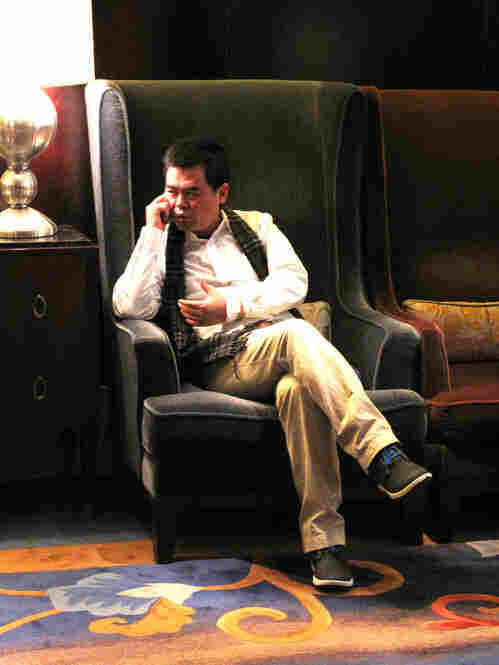 However, Bai, the school headmaster, believes Deng's success prodded the government into action. "The government would probably have given some money for free lunches anyway eventually, but I think it would have happened later," Bai says. But the journalist's program is facing challenges, in part because of its rapid expansion, including how to monitor funds and check that schools are spending the money on food for students. So far, it has relied on Chinese Twitter, requiring each participating school, including the one in Hujiaying, to post its weekly expense reports online. Deng hopes the government will adopt his Free Lunch model, believing that such transparency could help avoid the corruption that has plagued government projects in the past. Never one to shy away from a challenge, he is now planning to turn his attention to raising money to fund rural children's health insurance, something he believes he can achieve for just $15 a year. In Hujiaying, the school is taking matters into its own hands, showing the speed at which the program is evolving. Teachers at the school plan to launch a two-track system, with better meals with more meat for those who can pay an extra 2 yuan (30 cents) a day. The administrators of the Free Lunch program say they think this plan is acceptable. It's a sign, perhaps, of just how entrenched inequality is in China that even within a poverty-alleviation program, there are haves and have-nots.